The other day, while I was looking through my list of books I’ve read so far this year, I started thinking about how if there’s one thing I miss about reviewing, it’s how it made it so much easier to remember the details of what I read. I have no regrets about the amount or the kind of writing I’m doing these days — it’s what’s possible for me at this moment in time — but this still feels like a loss. I miss the act of delving deep into a book, and I miss what I discovered in the process. It’s not so much that writing down my thoughts helped cement them into memory — it’s more that without that exploratory act of writing, a lot of the time I never arrive at them in the first place. Still, this isn’t to say the way I read these days is shallow, or that I’m getting nothing out of my reading; it’s different than it’s been for the past decade, that’s all. I find myself returning to things more often than I used to, both in my mind and through the act of rereading. It takes me longer to feel done with a book, or a paragraph, or even just a particular sentence, and sometimes there’s value in that incompleteness, in the way it keeps tugging at my attention. Today I wanted to write about words that have been of particular use to me this year, but part of me worries that by doing so, I’ll reduce them to snippets devoid of context, when really it was their context that made it possible for them to affect me the way they did. The ideas conveyed by these words are important to me, but there is, I hope, no facile moral to them. They’re things I keep going over, sometimes arguing with them, sometimes finding solace in where they take me, sometimes adding a “but”, sometimes an “and”. They’re words that keep me company, words that help me become. They’re one of the main reasons why I read. In The Faraway Nearby, Rebecca Solnit explores the act of writing, the process of organising the world and our lives into narratives. She describes the danger, shared by novelists and essayists alike, of “betraying the complexity of what came before” through a too-neat ending, “that point when you bring the boat to shore and tie it to the dock and give up the wider sea”. Still, she believes that writing can make it possible to communicate truths that are too long, too subtle and too nuanced to do justice to otherwise. This idea resonates with me (I think it’s what I’ve been trying to do all my life), and at the same time it makes me want to be cautious when writing about words I’ve found helpful without the full benefit of their context. The context is my own, as much as it is the texts’. The other day I mentioned in a discussion that I favour the kind of writing that allows us to articulate ambiguity and then inhabit it. I like writing that makes room for loose ends; writing that, in Leslie Jamison’s excellent articulation, “allow[s] the messy threads of grief or incomprehension to remain ragged”. I find value in the tentative conclusion we reached together at Liz’s blog: that narrative has limitations we may never fully countervail, but there’s still something of worth in the attempt, especially when the alternative may well be cognitive chaos. There’s something of that in The Faraway Nearby, something I keep coming back to. This brings me to what is, to me, a parallel idea: it’s one that Maggie Nelson develops in The Art of Cruelty, whose opening section is titled “Styles of Imprisonment”. I’m no stranger to the particular anguish of feeling trapped between two propositions, none of which seem to do full justice to my thoughts, my feelings, or the reality of my life. I’ve experienced this in reading, in politics, in everyday existence, and every time I felt crushed by it, or boxed in, or forced to betray a complexity I feel in my bones. Nelson calls this the pressure to “choose between binary oppositions that are not of one’s making, and for which one has no appetite”, but she reminds us that resistance is possible. It brings me such intense relief, this idea: to think that I can take my time to be still, to exist between extremes; that I get to reclaim “it’s complicated” not as an evasion, but as a place in which to live — that it’s possible to, as Nelson says (in an evocation of Barthes): “live according to nuance”. I come back to this a lot when I feel the pull of imprisonment, which is not always external but sometimes of my own making. We treat desire as a problem to be solved, address what desire is for and focus on that something and how to acquire it rather than on the nature and sensation of desire, though often it is the distance between us and the object of desire that fills the space in between with the blue of longing. I wonder sometimes whether with a slight adjustment of perspective it could be cherished as a sensation on its own terms, since it is as inherent to the human condition as blue is to distance? If you can look across the distance without wanting to close it up, if you can own your longing in the same way that you own the beauty of that blue that can never be possessed? There’s a whole post in here waiting for me to be ready to write it, probably; I’m not done with this idea, not by any stretch of the imagination, and I can only get at it obliquely even now. Still, I suppose that’s a start. Much of this past year has been about learning to withstand need (social, political, interpersonal) without feeling diminished by it. It’s also been about rejecting the patriarchal notion that incompleteness or dependency weaken us, and exploring its full ramifications in private and public life (there’s a reason why Upheavals of Thought is the most useful book I read this year). I’m now able to say that I want to be more of the world, in many senses, and not be undone by this desire or the act of articulating it (Maggie Nelson again: “the fraught apprehension of our dependency (…), the radical undone-ness that can attend both loss and communion”). In my moments of greatest impatience with the confines of my life and the weight of unsatisfied need, I find a certain degree of relief in at least sitting with this feeling without shame, and with as little fear as is possible for me. It’s a work in progress, but once again I find that there’s value in the attempt. 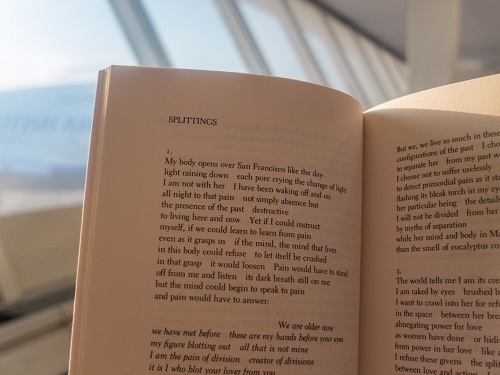 Lastly, I wanted to write about some lines from Adrienne Rich’s poem “Splittings”: “I believe I am choosing something new / not to suffer uselessly / yet still to feel”. This is an idea Rich returns to several times throughout the poem, saying in a later stanza, “I refuse these givens the splitting / between love and action I am choosing / not to suffer uselessly and not use her / I choose to love this time for once / with all my intelligence”. There are “buts” here as well as “ands”, mostly to do with the circumstances in which we are or are not able to choose to turn away from suffering; the extent to which relief can be an act of will; the times when it applies and the times when it causes us greater harm to think that it might. Still, these lines have been like a mantra to me these past few months — a mantra about accepting help, whatever shape it might take in each particular life; a mantra about hope; a rejection of inevitability. I like Rich’s use of the word “uselessly”, as opposed to “needlessly”. It seems to me gentler, devoid of blame or reproach; and it seems to hint at the kind of suffering that exhausts you because you’ve gone over it so often in your mind. There’s no lesson in the act of overcoming it, no facile insight — there’s only repetitive toil, which sometimes seems too daunting to go through again. This is why there’s such immense relief in thinking it’s possible to move past this suffering “yet still to feel” — without numbing, without loss, without rejecting love or human need, but with hope and openness instead. Regardless of whether or not I manage to make them true, these words have been a beacon. It always surprises me when I read words from you that are things that I have arrived at too/am in the process of arriving at because my way of arriving at it has been through spirituality, something which I never discuss in the bookish circles I participate in ‘cus. . . first, I guess I already have thriving other-spaces where I engage with and in all of that, and two, I feel too shy, too raw, with just enough anxiety about being ridiculed to bring all of that into this. Anyway, just to say that I love what you say about desire. I have no idea about the larger context from which that quote emanates it but I was actually discussing this very thing recently with someone—just enjoying the desire for the desire’s sake, with no eye to when it will be come to fruition, or even if it will come to fruition, but instead to take pleasure from whatever springs up just for the pleasure of the thought. as always, much appreciation to you for your thoughtful and thought-provoking words! Oh, that feeling of being trapped between two propositions where neither of them actually works is so familiar to me. I have felt that way incredibly often during this election cycle, particularly during the primaries when it was a question of Bernie Sanders vs. Hillary Clinton and thus a huge lot of dissent among people whose ideologies actually are very similar. >>He was a person who hated soft thinking on one hand and intolerance on the other; much of his life must be spent fighting a war on two fronts. Because it truly does seem, so often, that the world is asking us to choose between two simplistic things and neglecting all the spaces in between. And to disagree with the simplistic thing that more closely aligns with my actual morals can make it seem like I agree with the also-simplistic thing that aligns less with my actual morals, and it's always a struggle to decide if I want to spend time and energy making that distinction. ....I am super ready for this election to be over, is what I'm saying. Very much enjoyed this. I love that rich poem too. Have you read "A Wild Patience has Taken Me This Far"? It is in her collection by the same title. That one is my go-to mantra and I even got a tattoo of a spider in a web long ago to remind me of it. I had so many thoughts while reading your post. Thank you for causing them!